Wow. Everytime I see one of these computer animated masterpieces by Pixar, I am absolutely amazed. And every time I go in knowing that it is going to be hard for them to top their last one. But they do, every time. This time, it's not toys, or bugs, but MONSTERS! Monsters whose main purpose in life is to terrorize children from around the globe and to capture their screams, which, of course, can be harnessed into energy to power the Monster town of Monstropolis. Monsters, Inc. is a power company in this very business. They handle everything from the procurement of children's screams, to the conversion of scream into energy, to the distribution of that energy to the Monster community. Our two main characters are best friends who work at Monsters, Inc. James P. Sullivan, or Sulley (voiced masterfully by John Goodman), is the Top Kid Scarer and is an almost legendary figure at work (see picture below). 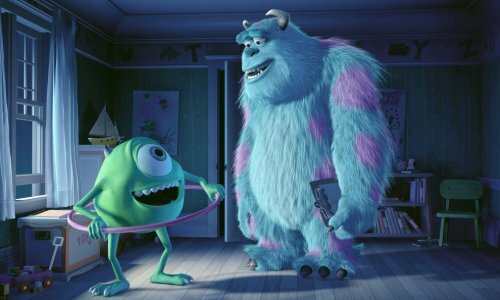 Sulley's Scare Assistant and long-time friend is the one-eyed Mike Wazowski (voiced unmistakably by Billy Crystal). Sulley and Mike are a great pair and their teamwork is desperately needed when a brave little toddler ventures through her closet into the Monster world. Now everyone knows that children are extremely dangerous, and this is no exception in Monstropolis. In fact, even the touch of a child can kill a monster (or so they are led to believe). The Child Detection Agency (CDA) is always on call to decontaminate Scarers upon their return from a child's bedroom. In one such incident, a particularly furry monster is shaved completely to the skin because he was infected with a baby's sock. HAHA! 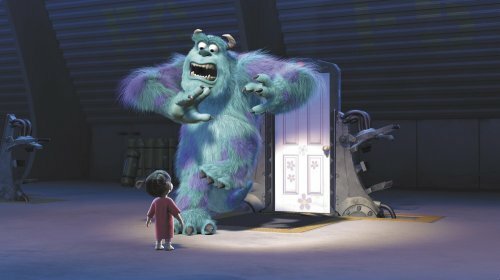 Anyway, when Sulley's toddler escapes into the town of Monstropolis, she begins to terrorize the town. Sulley and Mike quickly learn however that she is NOT deadly but is in fact quite helpless, and they vow to save her and to return her to her home. Of course, if the Monsters are not bad guys, and the toddler (nicknamed "Boo" by Sulley, and voiced by Mary Gibbs, daughter of Pixar story artist Rob Gibbs) is not bad, then who is the villain? That is where Randall (pictured below) comes in. 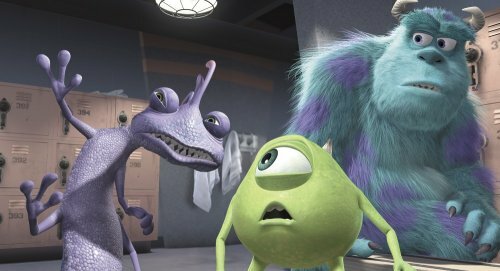 Randall is the number 2 scarer at Monsters, Inc. (and everyone knows that being number 2 can lead to jealousy, obsession, and evil). Randall is a chameleon-like monster who can even turn completely invisible. And it is Randall who is part of a plot to kidnap children in order to improve scream efficiency at Monsters, Inc. This all sets up a wonderfully imaginative and funny plot. But what really brings it to life are the artists at Pixar. These monsters were so strange-looking, colorful, cartoonish, and yet lifelike. Through much of the movie I was reminded of Sesame Street with all of its memorable characters. What Monsters, Inc. really added to this however was detail and scope. These monsters did not just stay in one place and entertain us with witty dialogue, but moreover they moved about their world (and even crossed over many times between Monstropolis and the human world). Visually, there are two things in this movie which just absolutely blew me away. First of all, Pixar has really mastered the use of hair on its creatures. I was extremely impressed over the summer when I saw Final Fantasy with its realistic depiction of people, especially with a particular scene in which a girl's hair is billowing in the wind. However, Pixar really out-did themselves here with its furry creatures. The shading, the movement, and everything else about these furry monsters really made them look real. The second thing that I was so impressed with was towards the end of the movie in which there was a scene involving a blizzard. Now THAT was stunning! Of course, in the end what really matters are the characters and how they make us feel. That is what makes these movies special. Mike and Sulley, and even the toddler, Boo, were funny, heart-warming, and cute as a button. Through their struggles, their friendship, and their individuality, we are touched, inspired, and very entertained. My six-year-old daughter was filled with wide-eyed wonder. She laughed hysterically at some parts. At others, she desperately clung to my arm in fright. She became excited through some of the roller-coaster like chase scenes. She cried towards the end at one especially touching moment. And she left the theater knowing that this was now one of her favorite movies. I must admit, I felt the same way. Finally, what really touched me most was the ending. This ending was absolute perfection. There are many movies which have great endings, leaving us with a dramatic plot twist or a hard-fought victory. Monsters, Inc. leaves us with what we long for the entire movie, and leaves much of it up to our imagination as Sulley's blue and furry face fills the screen. We witness the transformation from his look of anxious anticipation to that of complete and utter joy. And that pretty much sums up how we all felt as we exited the theater. 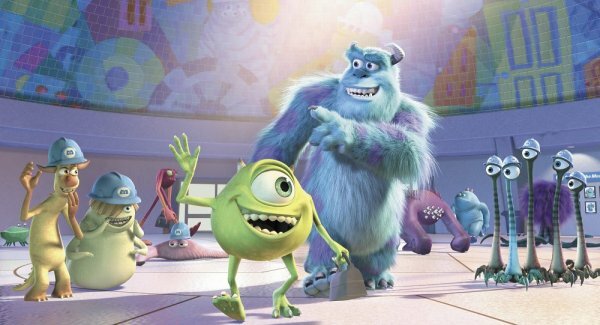 How would you rate the movie Monsters, Inc.? Click here to see theaters and times for this movie! There have been 59079 people to visit this page since Sat, Nov 3, 2001. And you are the first person to visit this page today!